I have been busy with my last assignments for school, and while I always think about posting a recipe, I just can't find the time. My husband and I will be celebrating our ten year anniversary next week (wow ten years! ), so I am trying to get things done. So I had this next recipe for far too long, it's just time to finally share it. It is so simple, yet so fancy. I don't know about you, but I always put up a wreath on our front door. The day after Christmas is when I start decorating and the wreath is on of the first to go up. Wreaths can go beyond the door, though. 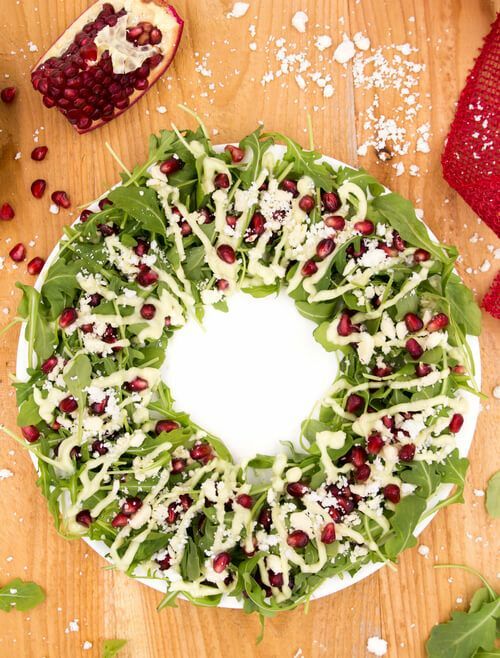 Wreaths, like this salad wreath, also belong on the table! When exploring and creating this salad, I decided to start off the dressing and base it off of avocado oil. What benefits does avocado oil have? Because this oil is made from avocados, it is full of healthy fats that boost our health. Did you know that in France avocado oil has the status of a prescription drug? That is because consuming it often can reverse arthritis. It also has the healing effects of treating psoriasis which is a condition where skin cells build up and form rashy, scaly dry patches. Blend avocado dressing ingredients together for 1 minute, or until smooth. Set aside. Arrange arugula, pomegranate seeds, and 1/4 cup crumbled feta cheese on a plate.